I said at the time that it takes a bit of imagination to see the potential in a bare root rose. They don’t look terribly exciting as gnarly, thorny twigs, but nonetheless I planted them out just a week after we’d arrived in our new home, in a rare moment when the ground was not too frosty. This morning, that same patch looks a bit better. It’s early days and there’s a lot more to come, but it’s decent progress! Our 4 year old niece named this ‘The Fairy Garden’ which has kind of stuck. 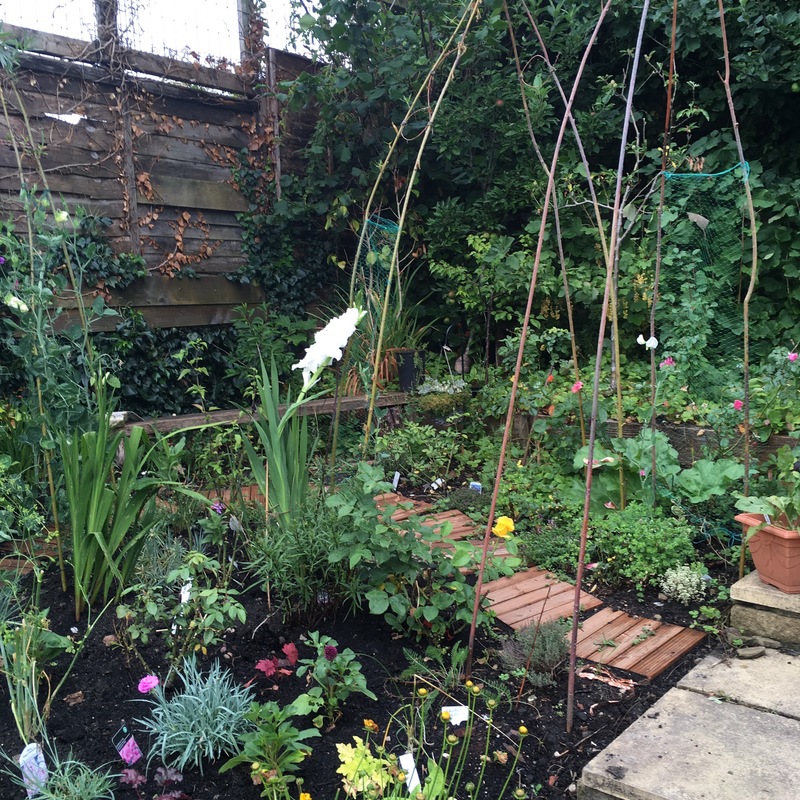 We’ve planted willow arches around a path lined with thyme and succulents, and put a cut flower garden in the central space. There’s a makeshift bench in the corner, and the bare root roses have started to bloom. 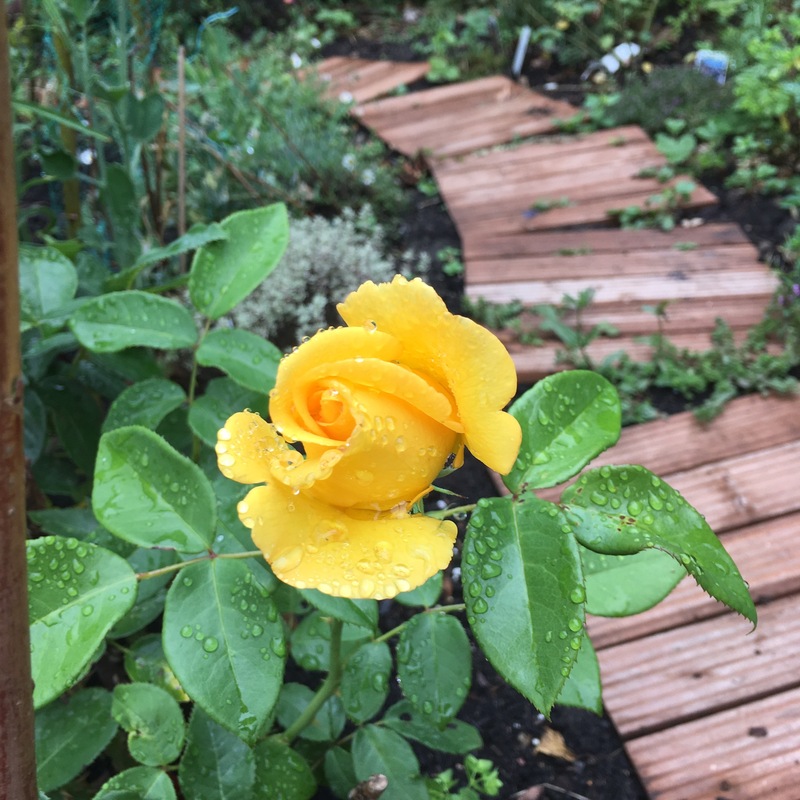 This lovely yellow bloom is the second flower from the rose ‘keep smiling.’ It’s a pretty sight covered in raindrops, and has a soft, sweet perfume. The first of these roses went into yesterday’s bouquet at FromeBlooms.com, and should be arriving at its new home in Edinburgh this morning. I do love it when a plan comes together, and I really am delighted to see these cheerful yellow blooms! I hope your garden plants and plans are all coming together.